Ward 32 Beaches-East York Councillor Mary-Margaret McMahon, centre, says farewell and thank you to ward residents in her column. 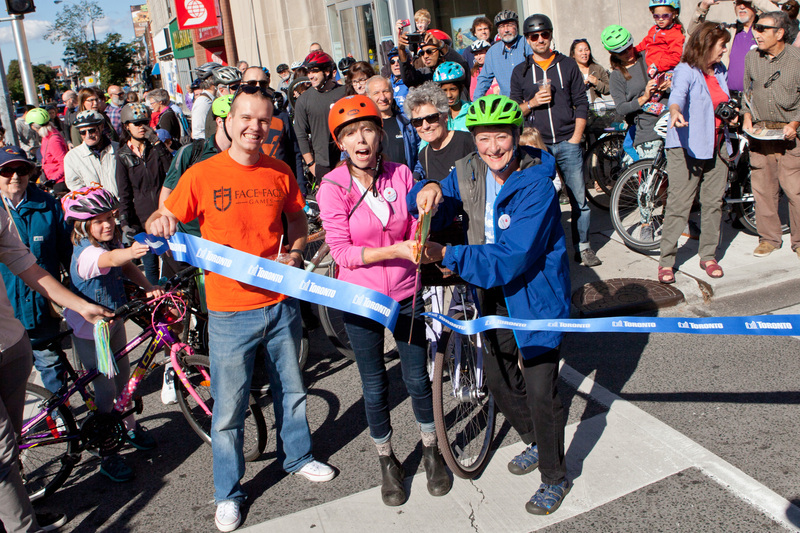 Among the initiatives she is proud of during her time in office is improving local cycling infrastructure including bike lanes on Woodbine Avenue. It has been an absolute pleasure to serve you for the last eight years! I thank you from the bottom of my heart for giving me the opportunity to become your City Councillor TWICE. Most of my life has been spent crusading for a better planet. That passion did not stop when I became City Councillor! As a collective force, City Council has voted on so many great initiatives city-wide. Suffice to say, doing things for the greater good has always been paramount to my decision making. Moves like Transform TO’s Climate Action Plan and our 10-year Cycling Plan are proof positive that we live in an incredible city and I am thrilled to have been able to contribute to that in a small way. Other notable additions to a more liveable city include our beloved Beaches’ Winter Stations; the City Hall Store Torontopia; Food Truck Freedom and Live Nation to come in our very own backyard. I have cultivated, encouraged and recognized community leadership through empowering and supporting everyday citizens and their particular interests and causes. I have connected dreamers and doers alike and fostered a culture of yes, anything is possible. Toronto is known as a City within a Park. We know how important spending time in nature is for our own mental, spiritual, and physical health. I have focussed heavily on parks in our area and right across the city! Every one of our parks in Wonderful Ward 32 has had an improvement under my watch. I’ve built safer streets in our ward by working with residents and city staff on neighbourhood appropriate traffic calming solutions. An important piece of my support for safer streets has been the creation of cycling and pedestrian infrastructure, such as bike lanes and wider sidewalks, ensuring our streets are safer for all road users. Educating residents on the need for gentle density along our main streets has been a goal of mine. It has not been easy! We need housing options for newcomers and locals who wish to age in place. Building up our arterial roads not only provides this much needed accommodation but also creates vibrant main streets with more foot traffic. I championed Laneway Suites! They will transform Toronto’s laneways to support new forms of housing, increase housing supply and demonstrate sustainable construction and design. I have helped address a range of housing needs, from shelters and community housing, to affordable rental and homeownership. It’s a human rights-based approach to housing and prioritizes the housing needs of all. What is more important than preserving our rich history? From laneway namings to historical walks and designated heritage sites, Beaches-East York offers a truly unique blend of past acknowledged and future potential. I have shared my deep interest in sustainable food and urban agriculture and contributed to moving forward many initiatives over the years. Our Farmers Markets, Backyard Chicken Pilot Project and Pollinator Gardens have helped put our ward on the map as a food hub.I have always taken a respectful and compassionate approach to our senior population. They are our mentors and our wisdom keepers. I have attempted to foster inclusivity, recognizing that our older citizens are a vibrant part of this diverse ward. Services in our ward includes a multitude of programs, housing initiatives and recreation. On the other end of the generational spectrum, Youth empowerment is vital to me. No child is too young to learn about the city and the importance of getting involved! Even though I worked as hard and efficiently as I could the past eight years, some of my projects will take a bit longer to come to fruition. I look forward to seeing the creative use of Buildings M&T; a new vision for the Bubble at Ted Reeve and hopefully the addition of Danforth bike lanes. I am leaving this work to our next Ward Councillor and I am confident to say that our future looks good! For upcoming council issues, you can contact councillor_bradford@toronto.ca as of Dec. 1.